It is now increasing evidence that Climate Change affects extreme weather. In particular, the hottest days are now hotter, and the number of the so called heat waves (periods of extreme high temperature for the season) worldwide has increased. Therefore, very extreme unusual events occurring more frequently now, like “Summer in Spring” episodes (i. e. June 2017 in western Europe). There is no doubt that climate warming impacts marine ecosystems and major changes are expected in their functioning in the near future. It is known that warming impact the structure and functioning of the plankton food web in coastal water, in particular in shallow ones that are highly sensitive to climate warming (Vidussi et al. 2011). Therefore, shallow coastal ecosystems of ecological and economic interests (i. e. exploited areas for aquaculture) are particularly vulnerable to heat waves. Moreover, in the case of the heat waves, since the resistance and resilience of the different planktonic communities facing warming could be different, the recovery of the whole plankton community after the extreme event could result in a restructuration and a consequent modification of functioning. 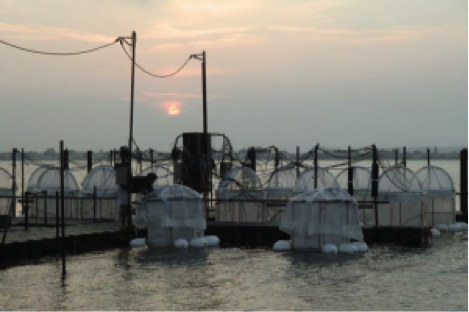 To study the effect of heat-waves, on coastal planktonic Mediterranean communities focusing on their resistance, resilience and recovery, a mesocosm experiment will be conducted using several pelagic in situ mesocosms of MEDIMEER. The in situ mesocosms will be immerged in the natural water column and therefore its water temperatures follow the natural water temperature variations during the day/night periods as well as during several weeks of the experimentations. To simulate a “Summer in Spring event”, the water column of several mesocosms will be increased 4-5°C to simulate a heat-waves event and maintained during 4-5 days at 4-5°C higher than the other in situ mesocosms with natural water temperature which act as control mesocosms. After these 4-5 days of heating waves, the applied increase of water temperature will be stopped and all mesocosms (heated and control) will have the same natural ambient water temperature. By applying a daily sampling during the experiment, the effects of heat-waves, including the resistance, resilience and recovery of the planktonic communities will be investigated. This mesocosm experiment is planted to be realized during one month in May-June 2019. This experiment will be an occasion to study the plankton communities or processes that the local team does not study like plankton parasites, virioplankton or preferential nutrient assimilation by different groups of phytoplankton or bacteria, etc. It is also an occasion to test new methods to study the plankton food web components or functioning like use of underwater camera or cytometry to study large and small plankton, or other underwater instruments like in situ Fast repetition fluorometer to study photosynthesis, etc. Graduate students at different levels (Master, Ph.D., etc.) are very welcome for training and participating in this experiment, all trainees will be supervised by the local team. International scientists and students are invited to contact the local scientists for propositions (Francesca.Vidussi@umontpellier.fr & Behzad.Mostajir@umontpellier.fr). About 10 scientists including students and trainees can participate in this experiment. Effect of increasing water temperature simulating global warming on the Mediterranean plankton food web functioning will be investigated using the pelagic in situ mesocosms of MEDIMEER in spring and fall 2018. In each of spring and fall mesocosm experiment approved Transnational Access users can participate. The applicants are encouraged to participate to both experiments; however this is not an obligation. A total of 252 person days can be allocated to external users involved AQUACOSM Transnational Access provision in 2018. We offer access to 10-12 persons for 20-25 days in 2018. The access cost offered by MEDIMEER is based on real cost calculation, which includes all needed preparatory work (before and at site), as well as specific training needed at the sites to complete the specific projects. The spring experiment will be realized from April 03 2018 during 3 weeks depending on meteorological conditions. This experiment is part of the PHOTOPHYTO project funded by the French National Research Agency (ANR). It focuses on the effects of global warming on the timing of marine phytoplankton blooms taking into account the different interactions between biotic and abiotic components, specially the match/mismatch between predator/prey. The in situ mesocosms are immerged in the natural water column and therefore its water temperatures follow the natural water temperature variations during the day/night periods as well as during the several weeks of the experimentations. The water column of several mesocosms will be increased and maintained at +3°C relative to other in situ mesocosms which act as CONTROLS mesocosms (Vidussi et al. 2011). In the spring experiment, the large majority of physicochemical parameters and biological ones such as abundances, biomasses of organisms and related processes (primary production, respiration, growth, grazing, etc.) will be investigated by the scientists involved in the PHOTOPHYTO consortium. However, as a TA, international scientists are welcome to participate to this experiment for specific topics such as viral ecology, parasitism, molecular diversity, metabolomics, biochemical composition of plankton, taxonomy of phytoplankton and zooplankton, prey/predator interactions (note that the dilution experiments are already scheduled). Master and PhD students are also welcome for training and they will be supervised by the local team. In addition, by collaborating with the local team, this experiment will be an occasion to test new ecological hypothesis regarding the warming effect on the marine plankton as well as new methods to study the plankton food web components or functioning like use of underwater camera to study larger plankton, or other underwater instruments like in situ Fast repetition fluorometer to study photosynthesis, etc. International scientists are encouraged to contact the local scientists for propositions (Please login or register to view contact information.). As there are also some phytoplankton blooms in fall in the Mediterranean coastal water, the fall experiment with more or less a similar design and protocols will permit to study the effect of increased warming on the functioning of plankton food web in the fall after the transition of the hot Mediterranean summer. The fall experiment will be carried out from October 02 2018 during 3 weeks depending on meteorological conditions. Plankton food web structure and functioning and their responses to global and local stressors. Interactions between planktonic organisms and changes in structure and function of planktonic food web. Effects of warming, increase of ultraviolet-B radiation and pH on planktonic food web. MEDIMEER is a unique platform on the French Mediterranean coast designed to run in-situ mesocosm experiments in coastal waters (Fig. 6.8.1). 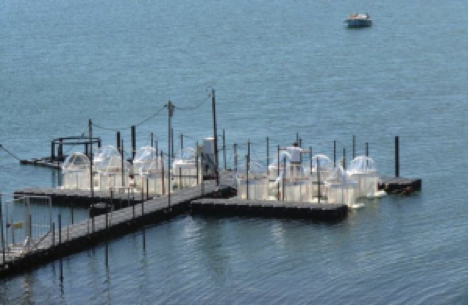 The facility with up to 12 pelagic mesocosms (1.2 m diameter, 2 m depth, ~2 m3 volume each) is moored in the Lagoon of Thau 20 km southwest of Montpellier, hosted by the Marine Station of Sète, which belongs to the University of Montpellier. The mesocosms are attached to pontoons, maintained by a floating structure made of stainless steel and moored in the lagoon to provide natural water-temperature and light conditions. Three mesocosms can be instrumented, enabling the acquisition of high-frequency data during experiments. Moreover, instruments for continuous measurements of temperature and solar irradiance are installed on the same pontoon. Several laboratories of the University of Montpellier hosted at the Marine Station of Sète immediately adjacent to the mesocosm infrastructure are dedicated to participating in MEDIMEER experiments. They provide access to 2 wet laboratories (total area of 35 m ), 2 microbiological laboratories (total area of 35 m2), a chemical laboratory (15 m2), 4 other laboratories (total of 65 m2 for sample processing), a workshop (50 m ) and office space (20 m ). Training on specific instruments by MEDIMEER technical staff and collaboration with local staff during sample and data analysis. There are also a boat, aquaculture tanks, cold room, and possibility for animal collection by a diver. Dormitories at the Marine Station of Sète or possibility to rent the hotel rooms or a villa.